Stir warm water and the teaspoon of sugar in a small bowl until the sugar is completely dissolved. Sprinkle the yeast over top. Let stand for 10 minutes, then stir to dissolve the yeast. In a large bowl, stir 1/3 cup sugar, salt and cooking oil. Add boiling water and stir until the sugar is dissolved. Stir in a beaten egg and yeast mixture. Gradually add in flour until a soft dough forms. Turn out onto a lightly floured board and knead for about 10 minutes until smooth and elastic. Place the dough in a large greased bowl, turning once to grease the top. Cover with greased was or baking paper and a tea towel (this will prevent the paper sticking to the dough when it rises). Place the dough in a warm place to rise. My Chinese friend advised me to let it stand in the oven with the light on and the door closed for 2 hours or until doubled in bulk. Punch the dough down, cover and let it rest for 5-10 minutes. Shape the dough into a log about a foot long, and then cut into 12 equal pieces. Chinese cocktail buns can be filled with many fillings - and this is the stage that the filling is added. Fill, shape and leave to further prove for another 15 minutes. Bake the buns for 15 minutes in a hot oven. 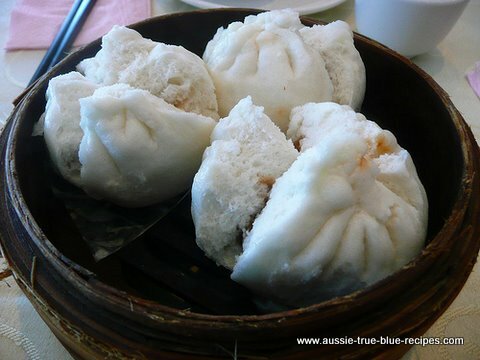 Alternatively, these buns can be steamed in a Chinese layer steamer.